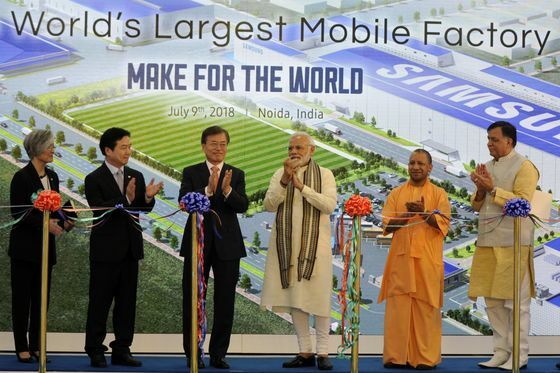 (Bloomberg) -- Samsung Electronics Co. opened the world’s largest mobile phone factory in India, in a win for Prime Minister Narendra Modi’s flagship program to lure investors to manufacture in the South Asian nation. The factory was inaugurated by Modi and South Korean President Moon Jae-in during their visit to the facility in located at the outskirts of Delhi. This will double Samsung’s Noida unit capacity for mobile phones to 120 million units a year from 68 million units a year, it said in a statement, but declined to give further details. The phase-wise expansion will be completed by 2020. Smartphone makers from Xiaomi Corp. to Oppo Mobiles are building factories in the world’s fastest growing market for the product bolstering Modi’s push to encourage overseas investors to “Make in India.” Asia’s third-largest economy attracted record foreign direct investment in the past year totaling $62 billion, including reinvestment. “The opportunity is just massive," said Faisal Kawoosa, who heads new initiatives at researcher CMR Pvt. “Such a large facility will help Samsung cater to the huge demand in a country of 1.3 billion people where there are only 425 million smartphone users. India’s smartphone market grew 14 percent with total shipments of 124 million units in 2017, the fastest pace of growth among the top 20 markets, according to International Data Corp. Demand for new phones is surging in India, helped in part by billionaire Mukesh Ambani offering $23 4G feature-phones, free voice services and cheap data plans. China’s Xiaomi said in April it will set up three more factories in India. “We are aligned with Government policies and will continue to seek their support to achieve our dream of making India a global export hub for mobile phones,” H.C. Hong, Chief Executive Officer, Samsung India, said in a statement. The Samsung factory will make everything from low-end smartphones that cost under $100 to its flagship S9 model, according to the company. Earlier this year, China’s Xiaomi displaced Samsung from the No. 1 smartphone spot in the country, breaking its long-held dominance. Last year, India overtook the U.S. to become the world’s second-largest smartphone market after China. There will be 780 million connected smartphones in 2021, compared with 359 million in 2016, according to a study by Cisco Systems.